Robot Sensor Market size is set to exceed USD 4.5 billion by 2024; according to a new research report by Global Market Insights, Inc. The global shipments are set to grow at 14% CAGR between 2018 and 2024. The industrial revolution 4.0 has accelerated the use of autonomous and collaborative robots in the production plants across the manufacturing industry, which is contributing toward the growth of robot sensor market. The robots are being increasingly adopted in production plants that can perform exceedingly complex tasks with the highest precision, ensuring human safety. For instance, BMW, an automobile giant uses flexible assistance systems such as exoskeletons and other automated solutions. The company has installed around 60 lightweight collaborative robots by Universal Robots in their production facilities in 2017. Robots are used with different types of sensors based on their applications. This has been possible due to the development of novel and innovative sensors that provide expanded capabilities. Some sensors provide an environmental feedback regarding the surroundings and the terrain. The components mainly used in the robots are proximity sensors, ultrasonic sensors, microphones, ultrasound sensors, acoustic vector sensors, vision sensors, and microphones for acquiring data from the environment. Laser range sensor technology, LiDAR, is gaining popularity in the robot sensor market and is used in service and collaborative robots for navigation & obstacle detection. These components are crucial for stimulating human-like abilities as they provide the system the ability to see, hear, touch, and move. The force-torque units in the robot sensor market is projected to grow at a CAGR of 12.5% owing to the increasing penetration of their low-cost. For instance, Robotiq launched FT 300 force-torque solutions for Universal Robots. These components can be integrated with Universal Robots in manufacturing plants for operations such as pick and place, machine tending, finishing, insertion, quality testing, and assembly. Force-torque sensors are imparting robotic arms with object-sensing capabilities that are significant for the diverse applications that robots are performing in today’s smart factories. 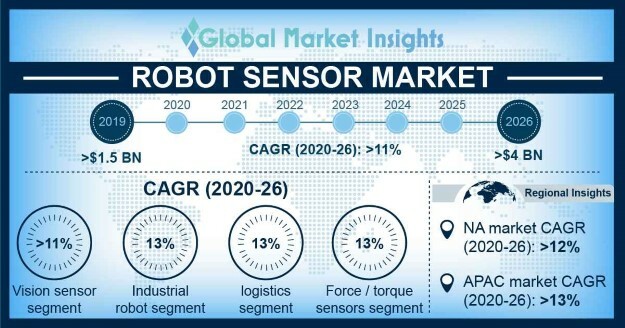 Moreover, robot sensor market is gaining traction as these are being integrated into the legs and torsos of robots, whereas it was integrated only into robotic arms in the past. The market for force torque sensors will witness a significant growth in the Asia Pacific region due to the increasing deployment of industrial robots in South Korea and China. These sensors are also working collectively with other technologies such as LiDAR, ultrasonic, and vision sensors for efficiency. Laser range sensor technology in the robotics sensor market which was estimated to be over USD 390 million in 2017 is expected to grow over the forecast timeline owing to the emerging cheaper LiDAR sensors. For instance, Velodyne HDL-64E LiDAR was valued at an enormous price of USD 75,000. Velodyne has introduced a low-cost LiDAR sensor, LiDAR Puck which is valued at USD 8,000 and is working on cheaper "solid state" LiDAR solutions, which do not offer a 360-degree view. Moreover, Google’s Waymo is also investing in the LiDAR technology to cut down on the sensor costs. There is a rapid global demand for logistics service robotics sensor market in the warehouses to increase the operational efficiency for processes such as custom packaging, picking objects container loading, and unloading. Warehouse automation has been attainable due to the development in sensor technology with ultrasonic and visual sensors used to guide the robots. This will furthermore propel the robot sensor market. Asia Pacific is the fastest growing region with a CAGR of around 15% in the robot sensor market. This is attributed to the massive demands from China, South Korea, and Taiwan. South Korea’s robot density is 347 per 10,000 persons in manufacturing, Japan’s robot density is 339 and that of Taiwan is 129. This increasing replacement of people with robots across industries is one of the major drivers for the robot sensor market in the region. In addition, the declining cost of sensors is propelling the demand in the conventional systems of manufacturing industries. Major vendors in the robot sensor market space are SICK AG, ATI Automation, Robotiq, OptoForce, and OMRON. The industry is characterized by diverse solutions from various manufacturers with a broad price range of products. To sustain competition, players have been focusing on developing technologically-advanced products ensuring low-cost solutions.